Pakistan's former prime minister Nawaz Sharif has been given a 10 year prison sentence on corruption charges related to several previously undisclosed luxury properties in London, which were funded through offshore companies and holdings in a scandal revealed through the 2016 Panama Papers leak. The deposed three non-consecutive term PM and business magnate along with his daughter and son-in-law were sentenced in absentia in an Islamabad court on Friday. Sharif is in London as is wife is reportedly receiving cancer treatment, but has previously spoken out against the National Accountability Bureau (NAB) court, calling its lengthy investigation into offshore properties held by the family "politically motivated". His daughter Maryam was given a seven year sentence, and the ex-PM's son-in-law, Safdar — still reportedly in Pakistan and facing imminent arrest — was given one year; Nawaz Sharif was further slapped with an eight million pound sterling fine ($10.5 million), and Maryam a two million pound fine ($2.6 million) on top of the prison terms. All three have been banned from elections for 10 years and four London properties are to be confiscated by the Pakistani state, according to the verdict, which they have 10 days to appeal at the Islamabad High Court. In a news conference from their luxury Avenfield House flat on London's Park Lane, Sharif while speaking alongside his daughter announced he plans to return to Pakistan: “I am returning to the country to face prison and the handcuffs if this is the price I have to pay for loving my country,” the former premier said. 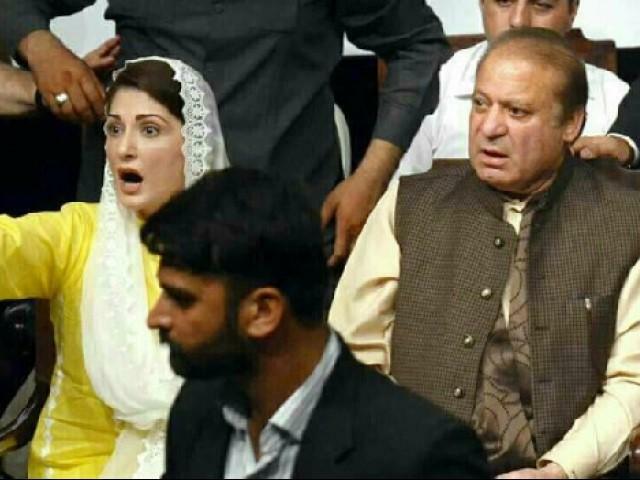 The former PML-N chief (Pakistan Muslim League - Nawaz) urged his movement to take to the streets ahead of upcoming general elections, elections for which both daughter Maryam and and her husband Safdar have been deemed by the court ineligible. “I will stand with the masses and stop those who are attempting are creating impediments in the way of the votes,” Sharif added. Upon news of the verdict, current president of the PML-N, Shehbaz Sharif (ex-PM Sharif's brother), vowed "I will go to our nook and corner of the country and make the masses aware of the miscarriage of justice & cruelty committed by NAB [National Accountability Bureau] against the leader who served this country with his heart & soul." And said further the "Pakistan Muslim League (Nawaz) strongly rejects the verdict of the Accountability Court in the Avenfield case. History will remember this verdict in black words. The decision is flawed, politically motivated and has glaring loopholes." Pakistan Muslim League (Nawaz) strongly rejects the verdict of the Accountability Court in the Avenfield case. History will remember this verdict in black words. The decision is flawed, politically motivated & has glaring loopholes. Maryam Sharif also took to Twitter and condemned the actions of the court: "This is a very small punishment for firmly standing in front of unseen forces," she said, according to a translation by Pakistan's Dawn news agency. "The morale to fight against oppression has increased today." Just ahead of the verdict, which had been slightly delayed, Pakistani security closed all roads around the Federal Judicial Complex in Islamabad and issued a ban on public assemblies or demonstrations in the area, fearing unrest. The court also reportedly delayed the sentence reading until after Friday prayers. Former Pakistan PM Nawaz Sharif was just sentenced to 10 years in prison and fined $10.5 million for corruption. The Pakistan Muslim League has long dismissed the proceedings which initially stemmed from Panama Papers revelations as a political witch hunt orchestrated by Pakistan's army to discredit the former PM and his family. Sharif's first two terms ended abruptly under intense military pressure and the second by actual coup. Concerning the possibility of extradition, the BBC notes that "The UK has no formal extradition treaty with Pakistan but Section 194 of the Extradition Act 2003 allows special extradition arrangements in exceptional circumstances." In 2016, data leaked from Panamanian law firm Mossack Fonesca and gathered by the ICJ [International Consortium of Journalism] showed that then-premier Nawaz and sons owned multiple off-shore companies and assets. The revelation led to severe backlash from opposing Pakistan Tehreek-e-Insaf and Awami Muslim League. Chiefs of both parties; Imran Khan and Sheikh Rasheed, submitted petitions in the SC against Nawaz’s assets claiming that none of them were declared in the 2013 general elections. The court ruled he'd been dishonest to Parliament, the judiciary, and the citizenry for failing to disclose the offshore assets and business ties. Though he himself was not directly named in the Panama Papers, Sharif's three children were linked in the documents to offshore companies. A warrant has reportedly been issued to arrest both Nawaz and Maryam at Lahore airport. But it will be interesting to see if the embattled ex-PM will ever actually follow through on today's assurances that he'll return to face justice.